Hello, hello, hello! I hope everyone had a fantastic weekend! Today the Mama Elephant gang is hopping with the fun new stamp and die set designed by Mama Elephant called Summer Garden! This set is the another collaboration between Simon Says Stamp and Mama Elephant (which is always a good thing in my book). I have a couple projects I made using these wonderful stamps and matching dies! The first is a card that I made with an angled panel. For something different. I stamped and colored the same images on a card front and on the panel. Then I diagonally cut the panel and backed it with a strip of vellum. Both stamped layers are colored with Copics (these images are perfect for coloring with pens and pencils). This treatment is a fun way to bring a little something extra to a card without it getting super busy. My next project are a couple of simple double layer tags. This technique is perfect for stamp sets with matching dies. I started by cutting 2 sets of tags using the Embellished Tag die. Then I stamped my flower image onto one of the tags. Then I die cut my top layer with the matching die so that the negative cut is directly over my stamped image. Here's an easy trick for die placement; use the negative of the tag as a placement tool. Put your stamped tag into the negative die cut piece (top pic) and tape it in place (if you're wondering I use this tape for taping down dies). Remember to place the tape on the negative template not the tag. Then carefully removed the stamped tag and replace it with the unstamped tag. Now tape down the die directly to the tag (bottom pic) and remove the other piece of tape. Now you're ready to put it through your cutter and the die cut is perfectly placed! Simon Says Stamp is giving away a $25 gift voucher to one lucky winner from all of the comments left on the blog hop:) Who couldn't use that? That is so cool! I love it!, I want to try it!!!!!! I love the tags! This is such a great set! love the tags !!! they are so pretty !! i love those tags, its so simple and lovely! What a great idea for the tags! Love them. Beautiful card! I like the way you used the vellum. The black & white flowers paired w/ the colored ink on the tags are so pretty! LOVE the card, so beautiful!!! And the tags are genius!! Oh so pretty!! I love the stamping in the negative frame! TFS!! I love the cutout tags -- I will definitely have to try this! I LOVE your idea on the card! So neat! Great tags too! Thanks for sharing such great ideas, JJ! I just love your tags! 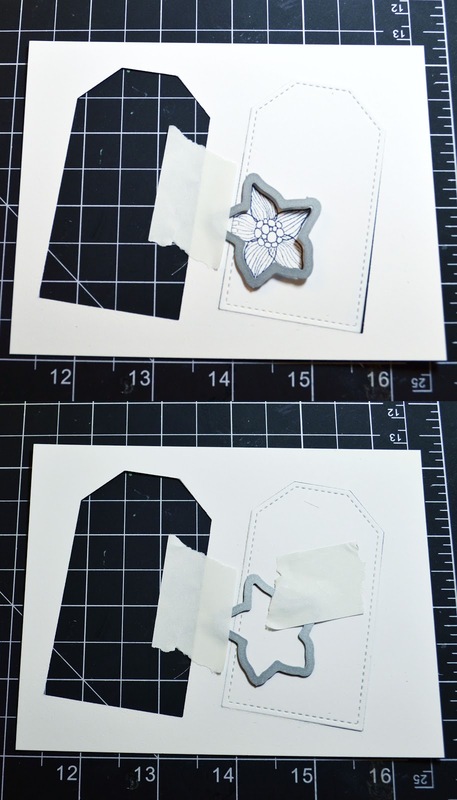 Thank you for the great tip for die cutting the tags! I really like the way you introduced vellum into your card! What a cool effect with the angled panel and the vellum! Absolutely gorgeous tags and your card is simply fabulous. Wonderful creativity!!! I love the cut-out tags, and your angled cut on the card using the vellum is great. I love the angle cut and the pop ups of some angle of the cards! So pretty! Always full of inspiration and beautiful craftsmanship - thanks for the chance to win! Love your card and tags! Beautiful colors and design. Your card and tags are DELIGHTFUL JJ!!! LOVE the layered stamping & vellum of your card and OH MY, your double layer tags are AWESOME, so clever having the pop of colour with the sentiment too!!! Outstanding card and tags J.J. You have shown this set can stand on its own in black ink only! Beautiful cuts. Great card and tags! Really liked the way you used the diagonal cut and vellum to create different layers to the same stamped image. Cool technique and the end result looks great! Your tag is amazing. Thanks for sharing your tricks with us so we can try this ourselves. Beautiful card and wow on those tags! love how you used the dies as windows and put the stamped flowers behind the window. Very creative. Love love those tags, and the card is just so pretty! I love your card and technique. Thank you for sharing how you did the tag. I love the tag. So elegant. Interesting ideas. Something new to try. Thank you. what a great card and tag! like all the cut outs! Gorgeous creations JJ, I love those flowers! What a fun idea for a card design, JJ! Love your tags too! Beautiful work! Awesome card! I love the split accent card and tags. Your card is lovely. I really like the effect with the split panel and your use of vellum. Love your techniques both on the card and tags. Love the use of the vellum. WOW! LOVE these! Very beautiful...can't wait give it a try! Thanks for the inspiration!! Love the simple elegance of this card. Thank you. Wonderful floral creations. I like the colors and the vellum strip on the first one. What a unique card. I love the way it opens with the image in the middle! I love your beautiful and striking card; the cut angle and vellum really add to the design!! Great idea with the tags, going to try! These are so awesome, JJ, love the split panel card and the tags are beautiful! Gorgeous! Love the split panel idea! Brilliant projects, JJ. Love them! Love your card and the split panel...neat technique!! the tags are so cute!! Great job! Beautiful card and tags! Love the split panel and the layered tag! Oh I love the tags with the negative die cuts! So glad I got this set, it's so pretty! Love hoe you used the negative. Gorgeous. Love the split card and the tags! Very nice! Love your projects! The added interest from the offset and vellum backing is really cool. Makes for a really modern looking card. OMG!! What a stunning card and tags!!! Beautiful ideas! These flowers are stunning! Very creative! Your card and tags are lovely! Love the cards and techniques! Love the peek through tag! Incredible use of the set. The negative cuts on the tags are fabulous! Awesome card & tag ideas. Just beautiful! So different too! Stunning! This is something I'm going to have to try. Thanks for the great ideas. What a great way to use the matching dies! TFS!!! Love these ideas. Definitely something I want to try. Love the die/stamp combo. I love your unique take on this stamp and die. Ooh I love that angled look with the vellum touch! Amazing! Your card and tags are so clever. I love both projects! Thanks so much for the great die placement tip. Wonderful stamp & die sets! Cleaver projects, like the ideas and this stamp set and dies. Great job. Precioso, lo voy a tratar de hacer también. So creative and inspirational, thank you. love the twist on your card! like the idea of the tags, too!!! tFS! Beautiful cards!! love the die techniques! thanks for sharing! Very interesting techniques! Thanks for the inspiration! thanks for the tip on cutting the two layers for the tags. I'm going to try this idea. It makes a dramatic looking tag. The first card is very pretty. Love all of the layers of all of the projects. Lovely! Thanks for the giveaway opportunity. Thank you so much for the tip on cutting for layered items! LOVE your tags and the angled card. Love the card and the technique you used. So cute! Your tag looks amazing. Thanks for sharing. So gorgeous! Thanks for the tips for making the tags - may have to give that a try. Lovely card and techniques you used. Thank you so much for sharing you're great ideas. The tags look amazing. Beautiful card, and those tags are so cute. Love the black and white with the sentiments in color. Oooh, love the coordinated flowers and dies. Thanks for sharing some unique cutting ideas. Mahalo! What a unique way to add interest to your card. I love the cut panel. I love these tags and card is also very beautiful! Thanks for the chance to win. I love the split tag. Thanks for the chance to win. Wow I just love the plain and simple cards. There is a sense of elegant to your work. Thanks for the inspiration! Love your card and tags. Thank you for the chance to win. Love that vellum technique paired with the flowers. So pretty. I have been having my eye on that set and coordinating dies since the release. Thanks to SSS for the giveaway too. Such a beautiful and 'Clever' way to stamp those gorgeous flowers on your card, JJ! I love your tags, too...You never cease to amaze me! Thanks for the tips on die cutting and for the link to the tape! I neeeeeeeeeeeed that set! NEEEEEEEEED! Love this stamp and die set. Your card and tags are great. What clever designs and pretty cards! I love the tags, there are so amazing!!! I love, love this stamp and die set! Cute card, and I LOVE those tags! Stunning card! I love the vellum between! I can't wait to ink my set up! Thanks for sharing! Love the cool design of your card! I can see why couldn't stop with just the card. This is a beautiful stamp set and you used it so nicely! The stamp set is stunning! Double layer tags are genius! 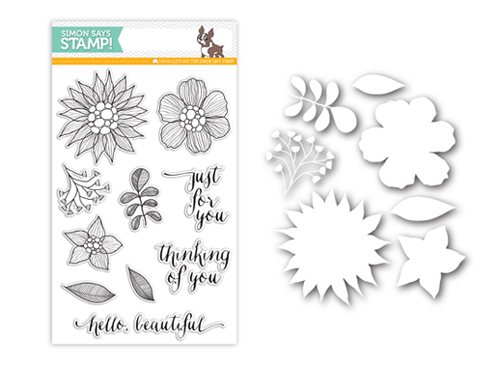 Love your creations and this stamp set is simply Gorgeous!! Very creative die-cutting techniques and gorgeous cards! Your card is gorgeous I love the angled look with the vellum the tags are wonderful I love when images are stamped and then a pop up image is added on top it's a great look! I love both your card and tags. I was wondering how the stamps would look without colour and the look very elegant. I love the vellum through your card. It really spices things up. Just love both techniques on your projects. The card is just gorgeous. Thanks for tag ideas using Summer Garden stamp set. Love your tags! Thanks for the chance to win. What a cool way to highlight the flowers on the tag! I LOVE the monochrome- what a great idea! I love all the different ways you used the dies! The tags look cool and I like how you split the top panel. Clever to use the vellum in between. Great tags and what a unique look you got on your card by adding the vellum! Love it! Thanks for the chance to win! Your card and tags are simply beautiful! Beautiful card and tags! Love the way you did the tags! Fun techniques. Thanks for sharing! That is such an awesome technique, thanks for sharing.. LOVE the tags! Great projects--love that double layered tag--really cool. Cool double layered tag - must look at again to try to understand your instructions. What a wonderful technique with the dies...thanks for the detailed tip. Super cool projects! I love the die cut tag! These are so original! Great job!! 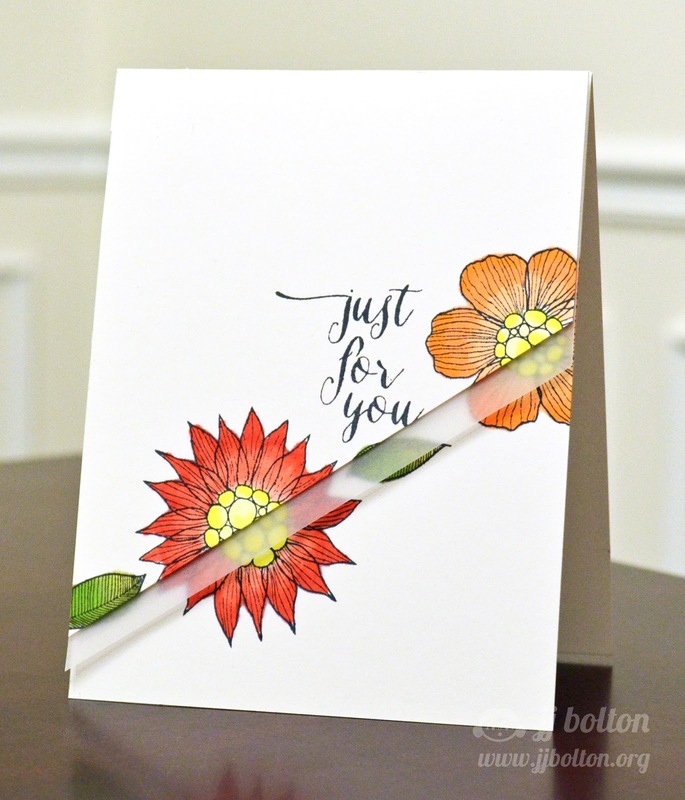 Beautiful card and great tip for die cutting! 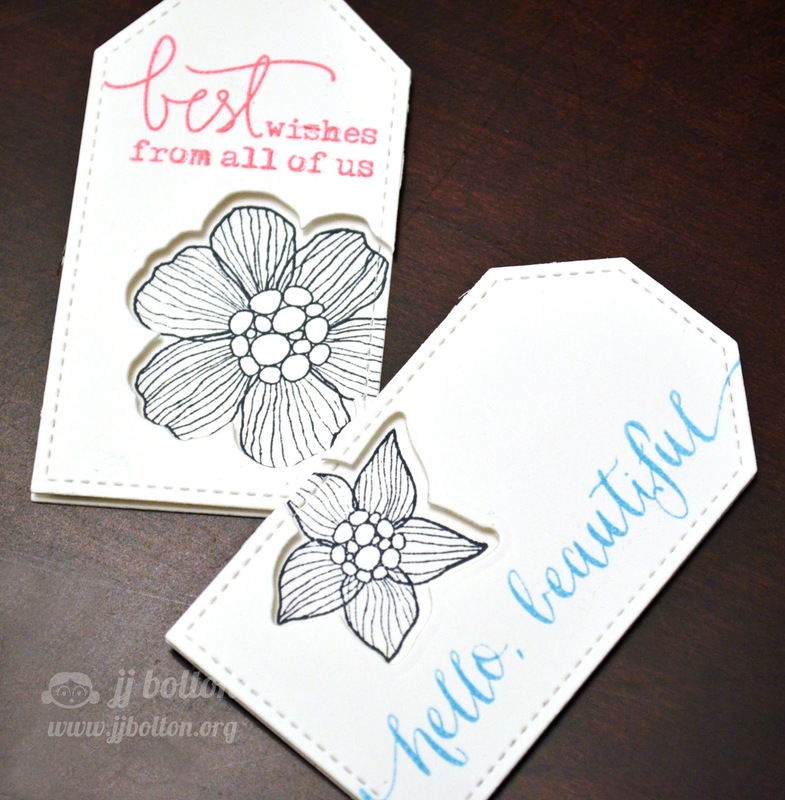 What a creative way to use the dies and the angled/vellum design on the card is fantastic! Love your creativity. Fab creations from this great set. Love the card and the tags - so different and cool! This is gorgeous and so unique! I love the tags, too! Such a pretty card and the tags are great. Thanks for showing how to line them up. I love love love your cut out negative space tags!!! Great stamps & dies! Your card is so pretty. I love the vellum cutout. Thanks for showing us your technique on the negative die cut for the tags. I am loving this set more with each hop through the blogs! Love the vellum strip across the first card! Beautiful! I love the angle cut on the first card - so unique and creative! awesome set and awesome projects! How cool to add the vellum strip! 2 awesome projects! The tags are just totally gorgeous. This stamp and die set is going straight to the top of my want list. I really like the tags with the image stamped inside the die cut. The vellum strip on the card panel is a really neat idea. As usual you do such beautiful work. Thank your for sharing and being an inspiration to me. Oh what a lovely layout in your card making it beautiful and adore the layered tags! I love the angle . . . so pretty! Your card and tags are beautiful. Thank you for the handy die cutting tip, too! I'm going to use this the next time I make a card! So pretty; love the cut angle. Omgee what amazing projects!! I so want to try this!!! JJ totally awsome. Love both projects. That little touch of velum really works perfectly. Gorgeous card and tags! I love the vellum strip on the card and those lovely flowers! I love stamps that have coordinating dies! Beautiful card. Love that idea with the vellum, such a soft look. Thanks for the chance to win. Both the tag and card are great. The peekaboo cut of the tag and the unusual cut in the card are wonderful! Beautiful projects! Love the card and the colors. Love the aperture window on the tags and the creative layered peek-a-boo with the vellum. Gotta try it too. Just love the stamp and die sets! What a beautiful card you made. Super cool technique with the vellum! Love it! Love the way you used the vellum! Love the split panel with the vellum! Gorgeous JJ! What a cleaver idea! Absolutely beautiful! I love your cards and tags! What a neat change! Oh, pure perfection! I am in love with those tags ... Those florals looks awesome in B&W! Thanks so much for the tips on die-cutting! What an awesome way to use the dies with the stamps for the tags! I never think of doing this - thank you for inspiring me! Fabulous card too - I love this new stamp and die set! Another one for my growing wish list!